Are you mired in a lawsuit with a business partner? Are you caught in a contract dispute? Call our Colorado commercial litigation attorneys to discuss your legal matter. Business and corporate litigation issues can be highly complex, expensive, and time-consuming. Call Burg Simpson at (720) 500-5825 or fill out our FREE CASE EVALUATION form to obtain the expertise only a highly-skilled Denver business litigation lawyer can provide. 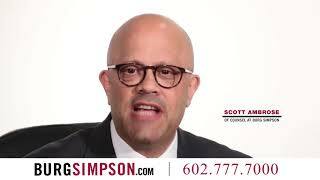 Contacting Burg Simpson is your next step toward finding the best resolution to your business or commercial legal matter. “Their work was impeccable.” – Lee Alpert, entrepreneur. OUR HIGHLY SKILLED BUSINESS & COMMERCIAL LITIGATION ATTORNEYS OFFER EXPERIENCED, AGGRESSIVE LEGAL REPRESENTATION FOR ALL OF YOUR LEGAL NEEDS. For a more comprehensive list of our CASE AREAS– click here or contact the Burg Simpson’s Denver corporate litigation attorneys today! Business and commercial law are so frequently paired together because both areas of law feature multiple crossover issues. Most attorneys familiar with one area of law are usually well versed in the other. Business law: This area falls under the jurisdiction of both state and federal laws. The foundation is built on federal law, which oversees stocks, investments, workplace safety, employment laws, and the environment. States can build on top of that, though, with their own laws – in these areas and others – in the form of licensing requirements and regulations for starting and running a company. Commercial law: The Uniform Commercial Code (UCC) bears the responsibility for regulating commercial law in the United States. The UCC, which debuted in 1952, is a set of laws that govern commercial transactions. Every state has adopted at least some part of the UCC – Louisiana and Puerto Rico only some, while American Samoa has not at all – but every state is free to do what they want. For a business owner, it can be tempting to negotiate a merger on your own without the assistance of a commercial litigation attorney. If you are a homeowner fighting against a major manufacturer, you are already at a distinct disadvantage. If you are about to retire and you have discovered your nest egg is gone, you need a lawyer, not another broker. When it comes to the complicated rules and regulations wrapped around business and commercial law, you need all the help you can get. Breaking up is hard to do, especially for businesses. It can be incredibly complicated. It can be emotionally charged which is why having a business litigation attorney at your disposal can help resolve things. The input and advice of objective, experienced counsel can prevent lengthy – and costly – litigation that all-too-often concludes with unhappy parties on both sides and can, instead lead to a more productive, reasonable resolution. Disagreements between joint business owners – whether they are simply partners, fellow members of a limited liability corporation, or shareholders of a larger entity – can include differences over operating responsibilities, the division of assets and/or liabilities, possession of intellectual property, questions over non-compete stipulations, and future ownership and management after the partnership’s dissolution. Our Denver based business and commercial litigation lawyers can protect your interests, walk you through existing contracts, obligations and liabilities, and ensure your compliance with the legal and regulatory dissolution requirements. Dispute resolution that avoids expensive litigation altogether is almost always preferable, but it is not always the most practical solution. Because Burg Simpson’s Colorado commercial litigation lawyers are recognized and respected as experienced trial attorneys, they bring that reputation and knowledge to your negotiations so that you can resolve disputes before they ever reach the courtroom – if at all possible. But when negotiations hit an impasse, or for any other reason that business termination escalates to the point of litigation, Burg Simpson’s veteran dispute resolution business litigation attorneys will fight for you in the courtroom. Consumer Fraud: This occurs when, in the context of a business transaction, false statements of fact are made, the person or corporation making false statements knew that they were false at the time and that the other party relied on those false statements to their detriment. This kind of fraud most certainly may require the expertise of a commercial litigation attorney to help you out. Fraud has become all too common in today’s “me first” culture. The media reports on tales of identity theft, credit card fraud, and investment scams, nearly every day. If you need a strong courtroom advocate in a financial or investment dispute, the business and litigation attorneys at Burg Simpson can help. Call us today to schedule a consultation with one of our experienced trial attorneys. 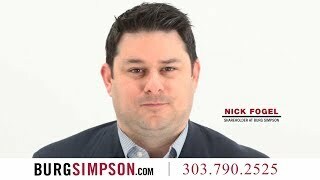 Burg Simpson’s Colorado corporate attorneys deal with a wide array of business and commercial litigation matters. Our expert business litigation lawyers are eager to help you whether you are a C-corporation, a limited partnership, an S-corp, a sole proprietorship, a family business, or just an individual with any issue related to business law. 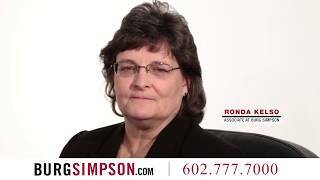 Call us right now to get assistance from the experienced Colorado bad faith insurance attorneys at Burg Simpson. Our trial lawyers are able to evaluate your case and advise you on the best course of action going forward. Business and commercial law can sometimes appear to have more questions than answers – even for experts. Our commercial litigation attorneys have put together a comprehensive Litigation FAQ HERE to help clear up some of the cloudier parts of this area of law. But don’t think you can read through it and argue your own case. This is a dense part of Colorado law, and nothing can replace an in-person consultation with a Denver product liability attorney. Burg Simpson will walk through every step of your situation with you. Call us before it is too late to help. Founded: Michael S. Burg started the firm in 1977. Attorneys: More than 60 trial lawyers providing nationwide legal representation, while operating out of seven offices in Colorado, Wyoming, Ohio, Arizona, New Mexico, and Florida. Passion: We fight for the legal rights of regular people, and work to hold negligent corporations and individuals accountable for their harmful actions or inaction. Mission: To be Good Lawyers. Changing Lives®. We want to change peoples’ lives for the better by fighting for them in court and securing fair compensation. We also want to give back to our local communities. Burg Simpson is committed to helping catastrophically injured people rebuild and thrive after a serious accident or injury. Over the last 40 years, we have handled almost every type of injury or wrongful death case. We are convinced no other law firm has the resources, reputation, or proven track record of success when it comes to assisting injured individuals and their loved ones.